Quiet and unimposing, Leo Allen seems to be the antithesis of an outgoing, energetic stand-up comedian, but he brings a reservoir of intellectual invention to the art form, steering clear of standard joke punch lines, instead delivering surreal true-life experience stories such as the scene inside a NYC McDonald’s in the wee hours. 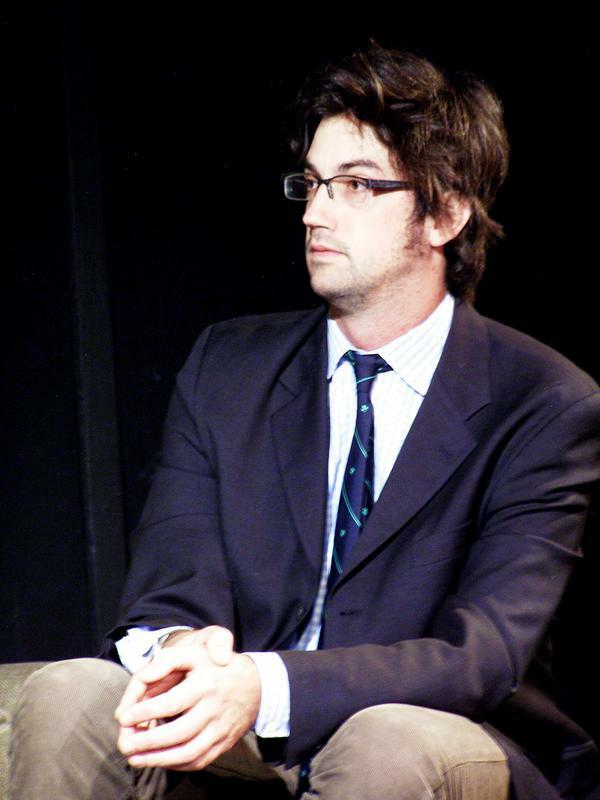 As a comedy writer as well, including a three-year stint on Saturday Night Live, Allen and his writing and performing partner Eric Slovin had a hand in recurring sketches like Will Forte’s “The Falconer.” Jester spoke with Allen about his experience in comedy, which even predates the arrival of the Upright Citizens Brigade in New York, and where his comedic ideas come from. Allen, a regular presence at Comix, the UCB Theatre and countless stand-up and sketch comedy venues in New York, returns to the UCB Theatre on March 20 as a guest with UK duo Bishop and Douch. Jester: How did you get into comedy writing and standup in general? Leo Allen: I lived in Israel for a year then I moved to Hoboken, then during that year in Hoboken, I was living with two guys who were going to acting school and that seemed impressive to me. … I always loved comedy so I started to go to open mikes, and just never stopped. At first, I made myself go to one a week but that pretty quickly became anywhere from four to 14 a week. I was really cranking them out. After you do it for a little while you start to figure out … a niche. J: How did you start building your own material and style during that time? LA: Just from sheer repetition and trying to remember not to quit. That’s one good thing. People tell you what’s funny. For the first few years, I was pretty much only performing for other comics. I don’t think there’s any intentional development of a style. It just happens. Then I was also doing improv. I had an improv group. This was before UCB or anything [was here]. … We would just do shows in basements. A lot of open mikes were in basement. We just kept doing it. J: Did you make a conscious choice at some point between doing improv and doing stand-up? LA: Well, there was no improv scene. It was just something I was doing. Also, Eric Slovin was doing improv at Gotham City. When we were waiting around for open mikes for hours, we would say, ‘Hey what if we did this?’ and we just started thinking of bits to do and started to do stuff together. Then after awhile, we decided to meet and write every day and wrote 60 or 70 sketches and then we did an hour show together. J: How did things start to turn where you started to get to play better places? LA: It just happened. I don’t really remember [how]. There was a whole scene [downtown]. At first there were little clubs, then there was Luna [Lounge]. First there was Rebar, then there was Luna, and there were more clubs, and there was just more stuff to do out there. But at first there really wasn’t a whole lot -- just a few clubs -- then these open mikes … in a basement of a bar or someplace. J: Did you play exclusively in alternative comedy type places or in places like Stand Up NY? LA: You would do the clubs too, you would definitely do the clubs. You would get a spot at the Cellar -- if you were a new guy they would let you go on between the real shows, like when one ended at 12:30 and you would do five minutes, which was a lot. Just little by little. [Slovin and] I got hired to write for an Internet thing. That’s when I quit my day job. We also got hired to work with Todd Barry and the Upright Citizens Brigade, probably around the last part of 1996. J: Do you write large amounts of material and whittle it down for what goes into your act? LA: It changes. … I write notes … and put it together. I find it hard to sit down and say ‘I’m going to write jokes.’ I tend to have an idea, and think it’s kind of funny, and explore it. … It’s different for everybody. I find that I can always write on stage. J: What do you mean by writing on stage, exactly? LA: I feel like that’s when I’m most focused. [I may have what] I’ve prepared, but then you go on stage and you’ll think of things that you never would have thought of, except when you’re under the pressure of being in front of people. … I might have an idea of this is how my joke goes, but in the moment of being in front of actual people, something would happen or your brain will be working in a different way. You could be sitting in a room for years and you would never think of it. J: Is it also the energy of the room and the audience? J: How did you get from writing for a website to writing for SNL? LA: We did a showcase at UCB and SNL saw us there. They had a showcase to write for … I think Colin Quinn was going to have a sketch show. But they ended up asking us to write for SNL, but months later. We did a showcase in February or March  and they asked us in August. We were in Edinburgh doing the Fringe Festival and got a call saying we got hired. J: Was your show with Slovin a sketch show per se? LA: It was more a stream-of-consciousness. There are sketches, definitely, but it’s more absurdist. J: What type of material did you write? Did you have something you specialized in -- like writing for one performer, or writing political sketches? LA: We were more of the weird stuff. We would write … for Chris Parnell or Will Forte … but we would mix it up. We would write by ourselves a lot, just the two of us, and throw something into the mix. In your first year, you’re only allowed to write one piece a week. Then as you get there longer, you can write two pieces, because there are so many pieces that never make it.